Choking among the elderly is extremely common and can lead to death if not addressed immediately. This is why caregivers are strongly encouraged to learn the Heimlich Maneuver and CPR. Why are seniors so prone to choking? Aging adults have decreased saliva due to the aging process of the salivary glands. Saliva is needed to swallow and digest food. Additionally, many elderly may not chew well due to loose or missing teeth. Some may have swallowing problems following a stroke or accident. It is at these times when the dietician and medical staff may consult and change the consistency of the resident's diet. Depending on diagnostic studies called "swallow studies", the consistency of the diet can be altered to accommodate the resident's swallow reflexes. If a resident appears to have difficulty with the consistency of a diet, caregivers should change the food and liquid and immediately. Whole consistency - Assistance is usually only needed for cutting. Cut-up food consistency - All food must be cut up no larger than 1/2 inch all around. Chopped food - All food must be cut up by hand to 1/4 inch. No finger foods. Ground food consistency - All food must be ground in a machine to a cottage cheese consistency and must be moist. Puréed food consistency - All food is prepared to a smooth consistency by grinding and pureeing it. Appearance is pudding like. 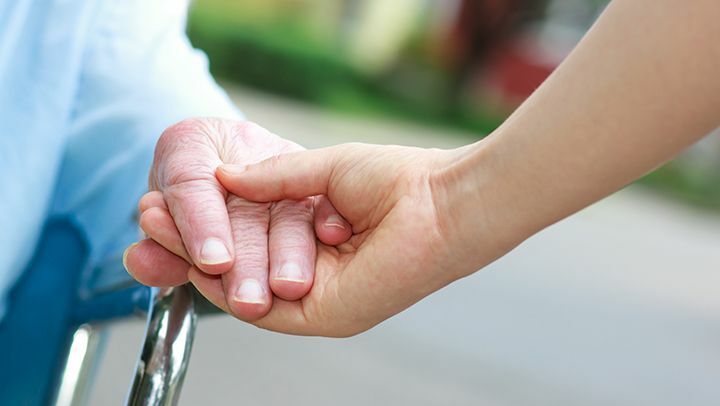 Thin and non-restrictive - Action depends on the resident's needs, but action may not be required. However, thickening agents may be required. Honey - Caregivers should be cautious due to honey's sticky nature. Pudding - These liquids are easily fed on a spoon and generally have low choking risks. Caretakers are encouraged to not hurry when assisting with meals since the elderly become overwhelmed and may choke as a result of the stress.